Space-saving hanging shoe organiser with 8 pockets. Each pocket measures length 5" x width 5.5" x depth 11" (13 x 14 x 29 cm). 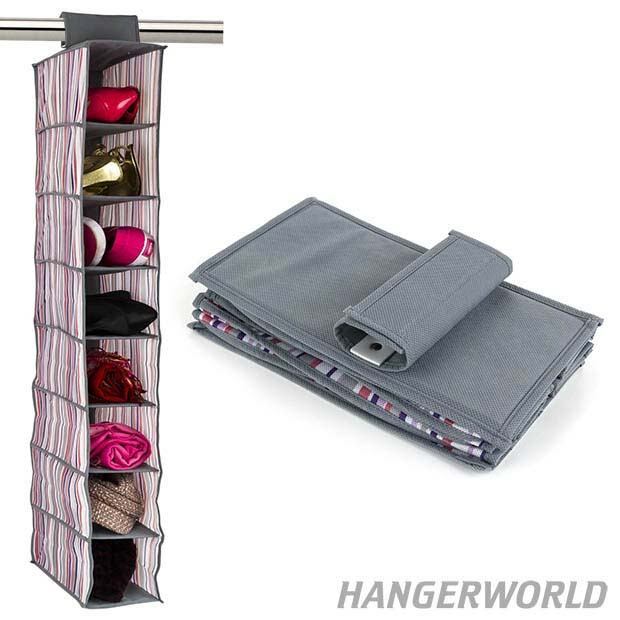 High quality, durable and stylish shoe storage organiser with grey, pink, purple and lilac stripes. Hangs easily & securely over any clothes rail in or out of the wardrobe. Clever design. Shoes and accessories are not included. Ideal for helping keep rooms tidy. Lovely gift. Size: Length x Width x Depth 39" x 5.5" x 11" (100 x 14 x 29cm) approx.